Will Europe's confidence crisis spill over into Asia? Standard & Poor's answers some of the most frequently asked questions about what potential impact the credit situation in Europe may have on Asia's economies and sovereign ratings. Worries over the credit standing of a number of eurozone sovereigns have driven their funding costs up significantly over the past few weeks. The deteriorating conditions prompted the eurozone members and the IMF to approve a €110 billion ($135 billion) rescue package for Greece on May 3. The downgrades by Standard & Poor's Ratings Services of Greece (BB+/Negative/B), Portugal (A-/Negative/A-2), and Spain (AA/Negative/A-1+) on April 27 and 28 have spurred numerous questions about the impact of developments in the eurozone on Asia's economies and sovereign ratings. Here are some the more frequently asked ones and our answers. Do you expect a widespread deterioration of sovereign creditworthiness globally? The picture of sovereign risks across the world isn't uniform. We have raised our ratings on a few emerging market governments in Asia (such as Indonesia) in the past year, and taken negative rating actions on several western sovereigns, including some in the European Union. We currently believe that most of the downward pressure on sovereign ratings is concentrated in Europe. So, the fiscal problems in Europe haven't had an influence on Asia's sovereigns? The main channel of contagion is likely to be through higher funding costs. For example, the Bank for International Settlements and the IMF estimate that cross-border lending by European banks to Asia is more than half a trillion dollars. If this external funding is reduced, it could result in higher external funding rates for some sovereigns and especially for some banks, but we see no evidence of that at this juncture. Could what happened in Europe happen in Asia? I.e. could investors turn their backs on some highly-indebted Asian sovereigns as funding conditions become increasingly tight? We don't expect the same degree of deterioration in funding conditions for Asian sovereigns, for several reasons. Among Asian sovereigns with high debt burdens, those that borrow mostly domestically (owing to high savings rates, home market bias and, in some cases, restrictions on outward portfolio investment) are unlikely to experience the same volatility in investor sentiment as those borrowing externally. Japan, India, and Taiwan are prominent sovereigns in the region that rely largely on domestic sources to fund government budget deficits. If financial turmoil persists in Europe, it is possible that Asian sovereigns that borrow internationally could pay more on their commercial external debt, at least for a time. Sri Lanka, Pakistan and Mongolia have significant external borrowings. However, these three countries' IMF programmes and the volume of bilateral and multilateral loans they receive partly shield them from the volatility of market interest rates. Finally, we expect economic growth prospects for the next three to five years to be stronger in Asia --except perhaps for Japan -- than in Europe. This gives Asian governments more policy flexibility than their European counterparts, since Europe's growth prospects are weaker, in our view. Japan's fiscal and debt positions are comparable to the highest indebted European governments. Will it not face debt sustainability issues at some point in the future? Japan shoulders the heaviest net general government debt -- projected at 106% of GDP this year -- among rated sovereigns in Asia. However, its debt is almost entirely financed by residents. The country is also a large net capital exporter. The low nominal interest rates the government pays reflect expectations for low inflation or deflation and weak private sector loan demand. So we believe that the government of Japan will not likely face near-term financing problems. Nevertheless, Japan faces a number of daunting challenges, including deflation and an aging population, in addition to the high government debt. The savings rate has been declining for some time and, in our view, it won't be able to support the incremental increases in Japan's government debt burden in the long term. We recently revised the outlook on the 'AA' long-term sovereign ratings on Japan to negative from stable. The government's efforts in forming a credible medium-term growth strategy and fiscal consolidation plan will be key in ensuring long-term sustainability of its debt. India's fiscal position has deteriorated in the past two years. Shouldn't investors be concerned? Like Japan, most of the Indian government's debt is denominated in local currency and financed from domestic sources. Although the size of the general government deficit increased to 9.8% of GDP in the fiscal year ended March 31, 2009, from 4.6% in fiscal 2007, the government has a plan to consolidate its fiscal position. The plan is based on the recommendations of the 13th finance commission, submitted in February 2010. We revised our outlook on the 'BBB-' sovereign ratings on India to stable from negative on March 18, 2010. India's strong medium-term real GDP growth prospects, about 8% annually in our estimation, combined with lower fiscal deficits, should help reduce its gross general government debt to about 68% of GDP in 2015, from 79% in fiscal 2010. Besides that, as indicated by the recent gradual nominal appreciation of the rupee against the US dollar, the improvement in investor sentiment has resulted in the return of net capital inflows into the country. 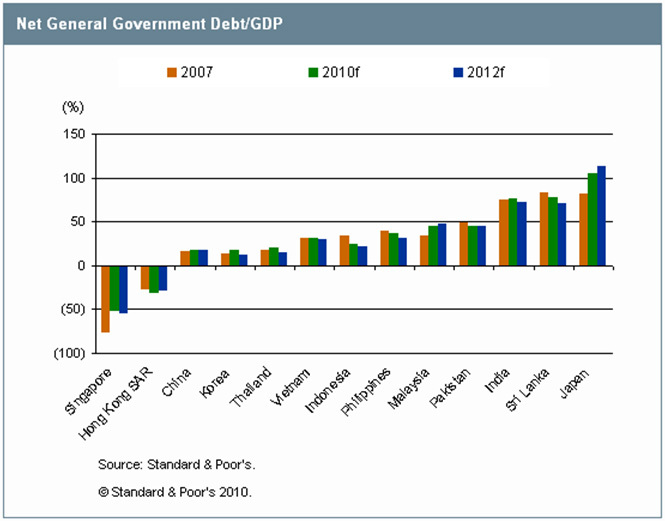 Indonesia and the Philippines have significant amounts of external debt. Are they vulnerable? In our view, Indonesia is more exposed to external investor sentiment than the Philippines. This is because corporations in Indonesia still have a high level of external indebtedness, and because non-residents hold more than 20% of Indonesian government local currency bonds -- making them part of the external debt in terms of investor behaviour. In the Philippines, on the other hand, domestic investors hold a large share of foreign currency-denominated government bonds, and the share of non-resident's holdings of local bonds is very small. The Philippines' external liquidity is further supported by more than $15 billion in annual remittance inflows, and central bank reserves currently amount to about $46 billion. This makes the Philippines somewhat less vulnerable to shifts in external sentiment. That said, both governments have nearly completed their external funding requirements for the year. So, unless market interest rates for Asian borrowers rise and remain at elevated levels over many months, we believe that these two sovereigns shouldn't be affected much. Private sector borrowers reliant on external funding are somewhat more vulnerable. Moreover, many investors view emerging Asia (including Indonesia and the Philippines) as attractive investment destinations relative to many developed markets. This is due to their stronger growth prospects, better demographics, lower government debt burdens, and adequate external liquidity. We believe the combination of these factors is likely to maintain capital inflows into Asia. So, are you expecting higher capital inflows into Asia? If global risk aversion rises across the board or if new financial market regulations result in diminished attractiveness of cross-border investment, we believe that many Asian equity markets could be hurt. On the other hand, many of the major Asian economies are net capital exporters (including China, Japan, Taiwan, Hong Kong, Malaysia, Thailand, and Singapore). So, part of their funds could be pulled back to Asia and re-invested within the region. What is the likely impact on Asia's economic growth? Because of higher funding costs, governments of countries such as Sri Lanka and Pakistan may have to delay their return to the international markets for funding. Governments and companies in Indonesia and the Philippines may have to pay higher interest rates. If the current situation leads to a wider economic slowdown in Europe, Asian exports and inbound foreign direct investment could also be hurt. Many Asian countries with healthy government finances, such as China, Singapore, Hong Kong, Korea, and Thailand, are likely to be able to mitigate an economic slowdown through further stimulus programs in the short term. However, a prolonged reliance on economic stimulus programs could raise the leverage of these economies excessively, contribute to asset bubbles, and reduce long-term growth. To sum up, it seems you don't expect any immediate sovereign downgrades in Asia following the ones in Europe? That's correct. 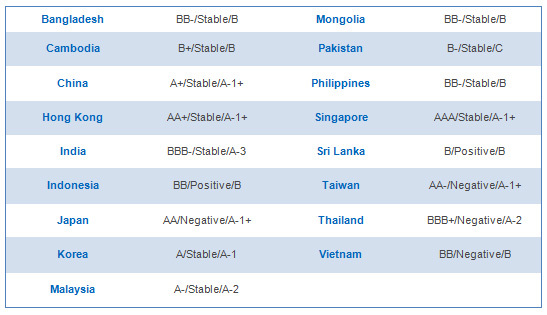 We don't see any immediate impact on Asia sovereign ratings from the unfolding events in Europe. But we are monitoring the potential medium-term effects of prolonged investor risk-aversion, slower global economic growth, and the possible negative impact on the European banking sector. Of course, specific idiosyncratic risks may be driving Asia sovereign ratings down (or up) in the near future. In addition to Japan, we have negative outlooks on the sovereign ratings of Thailand, Taiwan, and Vietnam. But the main drivers of their credit quality stem from factors other than the turmoil in Europe. Elena Okorotchenko is a managing director and analytical manager of Asia sovereign and public finance ratings at Standard & Poor's.